Come join us. Visit often. And make these Gardens your own for generations to come. Descanso Gardens is a member-supported botanic garden. Your membership donation provides opportunities for education, exploration and enjoying the wonder of the natural world. 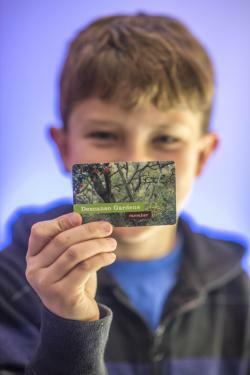 Join the thousands of people who support Descanso Gardens through an annual membership. Members enjoy many benefits, including discounts at the Descanso Café and the Gift Shop, class discounts and members-only events. Please note that memberships are non-refundable. Descanso members also receive free admission to more than 250 botanical gardens across North America through the American Horticultural Society’s Reciprocal Admissions Program. Always check with the garden you plan to visit to see if there are any admission restrictions. As of Dec. 1, 2014, Descanso Gardens enforces the 90-mile exclusion policy for members of other area botanical gardens. Click here for a list of participating gardens. Descanso Gardens offers several category options to best fit your membership needs. All are valid for a full year from the time you join. You can now download your membership card to your smart phone. See instructions below. Please note: To purchase or update your membership, your operating system and browser need to be upgraded to the latest version. This is an Internet-wide requirement to ensure the highest level of security while processing transactions. 10% discount at participating nurseriesMemberships are non-refundable. Next time you are at the Gardens, use your phone to display your cards. For more information about membership, please contact the Membership Office at (818) 952-4390 or membership@descansogardens.org. The office is open 9am to 4:30pm, Monday through Friday. Descanso Gardens membership is non-refundable unless a duplicate payment was made for the same membership. In that case, the request for refund of over-payment must be made within 30 days of the charge.